Thank you for showing the side-by-side comparison of the different bags. That is so helpful! I also saw some new (to me) fabrics here too. I love the way you displayed the bags. It was really a great way to see them all from different angles! Wow your bags are lovely. My daughter’s best friend is called Trillium. 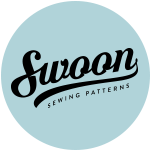 I am having so much fun discovering Canadian designers, sewists, and fabrics. Love all 4 of your totes. Love Blue Calla patterns. Love your trillium tote! I’ve gotta decide what to do with my piece of ‘burly beavers’ fabric. Killaloe Sunrise is one of my favourite beavertails too! Ever been to Killaloe? LOVE your bags, great way to see them and compare them. I learned some fun facts about Canada 🙂 Thanks for sharing. Awesome giveaway! Your bags are awesome. I like your writing style as well! Happy Canada Day July 1st.